Jack Cossid identified the two Naividel brothers, Lushka (Hillel), and Mota (Mordechai) as members of the Naividel family that he knew. They were both attornies. Jack remembered that Lushka had married an opthomologist from Kovno (Basia Meisler from Ponevitch), and Mota had been engaged to a Karabelnik women, but Jack lost touch with them and assumes they married. Jack did not hear about them after the war and therefore assumed that they had died during the war. There was also a sister who ran a variety store, and another brother Reuven, the youngest who ran a bicycle shop, and finally a youngest sister the same age as Jack. The two sisters and Reuven and their families were all killed in the Holocaust. A Macabee group (kvuza) was organized by and named the "Naividel Kvuza." A picture of the group, including Lushka,is in the photo section. Following the information, the author eventually located Beny Naividel, son of Mordechai Naividel in Tel Aviv in 1994. According to Beny Naividel, his Uncle Hillel his wife Basia and daughter Rachel, and his father Motta (Mordechai) Naividel were in Kovno when the Nazis invaded Lithuania, so they fled East with the Russian army and spent the war in Uzbekastan, near the Chinese border. Motta's first wife and a young daughter were in Yurburg and were killed in the first week of the war by the Nazis and their Lithuanian sympathizers. After the war Motta and Hillel and his family returned to Lithuania after the war and lived in Vilna. Hillel eventually became the President of the Supreme Court in Vilna, and died in 1969 in Vilna in that capacity. During the war, in 1941, Motta became the Attorney General in the Lithuanian Government. 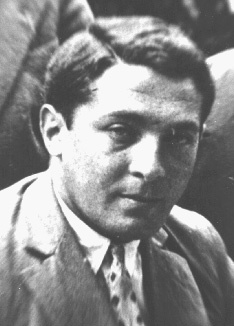 After the war, Motta wanted to reach Palestine and was involved in a failed airplane hijack attempt in 1945; it was intercepted almost immediately by the KGB and Motta spent 8 years in prison as a result, a "Prisoner of Zion." At age 76, in 1979, he and his second wife and son Beny immigrated to Israel. Motta died in Ber-Sheva, Israel in 1993. Hillel's daughter Rachel said that her father "Hillel left Yurburg only about a year before the Nazi invasion and in fact through a misfortune that happened to them - that their house in Yurburg burned down and that he then decided to move to Kovno, where they had a big flat. On the day of the Nazi invasion, they left everything behind and left Kovno with very little luggage. On the way, his wife Basia's parents, Motel and Rachel, felt that it was a pity that they had left the nice, big flat in Kovno and, without telling the others, they took a train back to Kovno. Of course, they were killed there soon after their arrival. The others travelled for several weeks and finally arrived in Tashkent, in eastern Russia, where they spent the rest of the war years. Rachel was a young child then, but she remembers that they lived in a small house which they got, since her mother was a doctor. The house had two rooms and they gave the bigger room to two other families, and lived - all of them together - in the small room. After the war they went back to Lithuania and settled in Vilna. "